It doesn't matter whether you live in coastal Oregon or landlocked Illinois. If yours is a shady lot, moss may grow on your roof. Be wary. Though it may not seem like a threat, moss can shorten lifespan of shingles and leave your roof vulnerable to damaging leaks. Fortunately, it's easy to remove. Here's how. You might like the look of moss on your roof, thinking the soft, green fuzz adds a bit of rustic charm to your curb appeal. 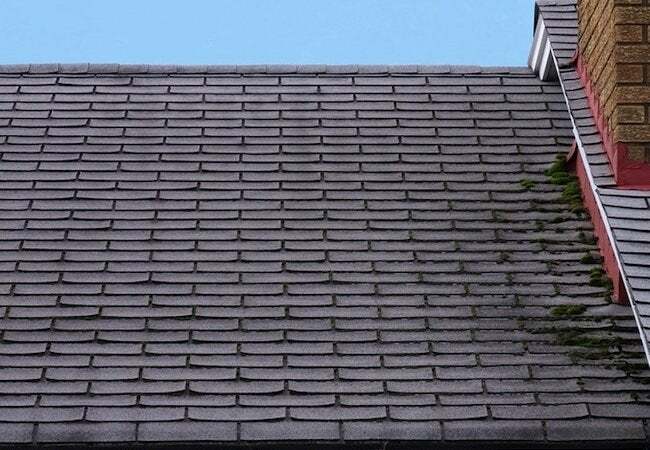 But the fact is that invasive moss tends to wheedle its way under the shingles, eventually prying them up and creating a perfect opening for rot- and mold-causing moisture. In other words, no matter how you feel about its looks, there’s nothing to like about the consequences of a mossy roof. Act sooner than later to manage this all-but-benign threat to your home. To remove moss from your roof, grab a ladder, a spray-nozzled garden hose, and a long-handled scrub brush. Plus, for your safety and comfort, be sure to wear slip-resistant shoes as well as rubber gloves. On a steeply pitched roof especially, you may also want to secure yourself via rope to a fixed object like the chimney. Now, starting from the peak and working your way downward, wet small sections of the roof before using the scrub brush to loosen the grip of the moss. Once it becomes detached from the shingles, hose the moss down and off the roof, taking care not to let it settle in—and clog up—your gutters. Don’t be tempted to use a pressure washer for the task, as its high-powered spray can do about as much damage as the moss you’re removing. Additionally, note that if water alone doesn’t do the trick, you can repeat the process, this time with a store-bought cleanser. If using a chemical treatment, however, remember to protect the plantings around your foundation with a thin layer of plastic sheeting.